If boiling water is poured into a thick drinking glass as well as a very thin wine glass, of the two, which is more likely to crack? The thick glass is more likely to crack since glass is a poor conductor of heat. In a thin glass, the heat passes more quickly from the glass into the surrounding air, causing the glass to expand equally. When hot water is poured into a thick glass, the inner surface expands, but the outer surface does not. It is this extreme stress on the glass that causes it to crack. 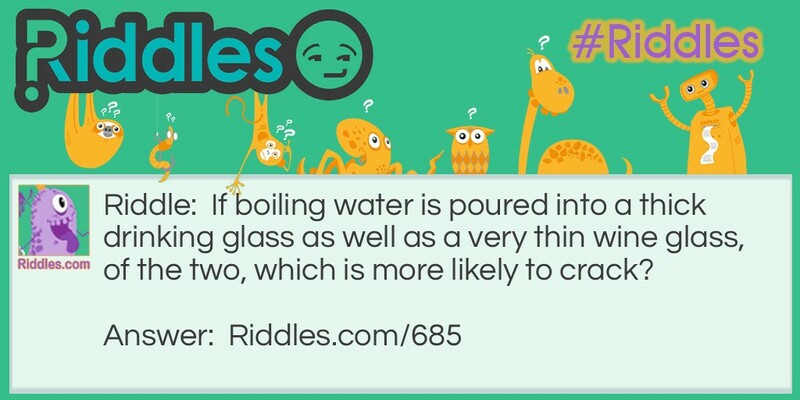 Boiling water Riddle Meme with riddle and answer page link.